The need for the Seattle First United Methodist Congregation to create a new home grew out of a difficult decision to leave their historic property. Faced with moving after nearly 100 years, the Building Advisory Board lead a lively discussion on how best to meet the spiritual needs of the community, how to grow the congregation, and how to continue serving those in need. 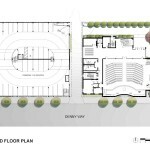 After evaluating many sites, and considering alternatives for the building arrangement, the historic church was sold and the Church purchased the property at 2nd Avenue and Denny Way. Two structures make up the campus of First United Methodist Church. The main church building, located on the corner of Denny and 2nd Avenue, houses the administrative offices, classroom, Fellowship Hall and the Sanctuary. 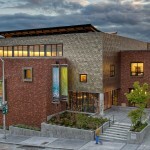 The Urban Outreach Building, on the corner of Warren and Denny, houses a community center for those in need, including sleeping, eating, education and health facilities, and parking on the upper floors. 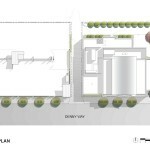 an alley, which bisects the site, is a four-story parking structure with one floor of urban outreach space at street level. 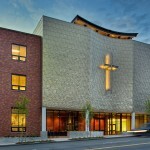 Exterior materials of the church building are brick and hammered titanium, and the prominent feature of the sanctuary building is a large cross on the south facade. 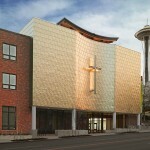 Two entrances serve the church facility – one on Denny Way adjacent to the offices and Fellowship Hall, the second on Warren Avenue North, which is the primary entrance for the sanctuary level. 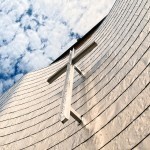 The building’s worship space will feature a 29-foot-tall wooden ceiling on a steel superstructure. Walls will be of textured plaster, and two large stained-glass windows will help identify the spaces as our spiritual home. The sanctuary includes a combination of pews and chairs with about 100 seats in a second-floor balcony. 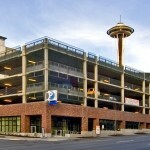 The adjacent parking structure will contain approximately 120 parking spaces, while its first floor, with direct access to Denny Way, will have approximately 7,200 square feet of human service delivery space for our congregation’s urban outreach ministry to homeless and underserved people in our new neighborhood. 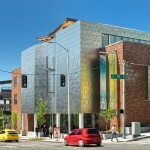 The building is the first new church built in downtown Seattle in over 40 years. We hope it will serve our community well over the coming century. 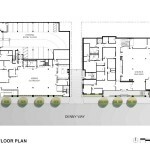 Images courtesy of Bassetti Architects. 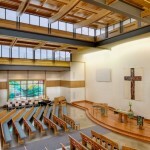 Description courtesy of Bassetti Architects and First United Methodist Church. Architectural work completed by Brian Rich at Bassetti Architects.